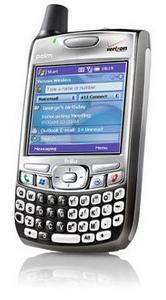 CES 2006 - As expected, Verizon Wireless has offically launched the Treo 700w. This is also confirmation that the device is named the Treo 700w, at its announcement Palm did not actually name the device. The Treo 700w is a little different software wise when compared to other Windows Mobile 5.0 devices, palm added a suite of software to improve the usability. Read on below for a list of the new features. Verizon Wireless is selling the Treo 700w for $399.99 after a $100 mail-in rebate and 2-year service contract. MobileTracker will have a full review of the Treo 700w from Larry Becker, the Palm professional who reviewed the Treo 650 for us last year. Ability to ignore a call and quickly compose a text message such as "In a meeting" or "Can't talk right now" by selecting the "Ignore with text" option from the incoming-call screen.